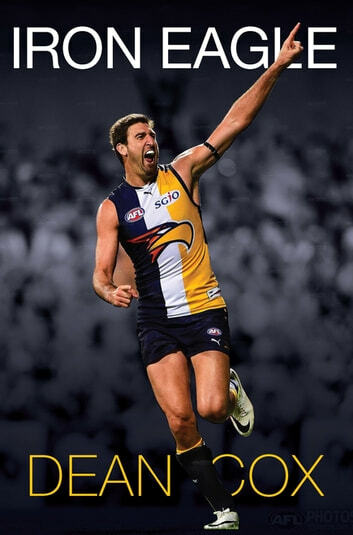 For fifteen seasons, Dean Cox was the 'Iron Eagle', a seemingly indestructible 203-centimetre ruckman at the heart of a famous - and at times, controversial - West Coast Eagle side. Tough, loyal, relentless and highly skilled, the big man from the Dampier Archipelago rose from humble beginnings to become the lynchpin of the Eagles' famous 2006 premiership, a six-time All-Australian champion and, ultimately, the West Coast Eagles' record-holder for most games played. Iron Eagle is Dean Cox's incredible and inspiring autobiography - a no-holds-barred chronicle of a wild childhood in the Pilbara that evolved into a glorious football career. With unflinching honesty, Cox takes us inside West Coast's glory years - the big games, magic moments and thrilling battles - and lifts the lid on the tumultuous period that followed the Eagles' epic 2006 flag win.